The epiphany came in a South Florida café sitting next to Carlos Gámez Pérez. The author of “Abducciones en la que no es y nunca fue tu ciudad,” which I am translating for my honors thesis, graciously agreed to meet for an interview right before he would return to Spain. While speaking about his childhood in Barcelona, Carlos used the phrase, “something that would forever change my life,” and it was if everything froze right there in the subtropics. I understood this very moment was changing my life; it was the final assurance I needed that literary translation was the future I desired. Even after studying under and attending lectures by famous poets and writers as an Emory undergraduate, nothing had brought me as close to the crux of creation as translation. A few months prior, I had discovered my proclivity for this interdisciplinary trade that invoked all of my favorite intellectual outlets— literature, modern language, creative writing, and politics— in Professor Lisa Dillman’s course on literary translation. Translation immediately captivated my interest because of its potential for social healing via broadening perspectives and through its capability to forge connections between different cultures. Having just returned from two consecutive study abroad programs in Argentina and Spain and preparing to embark on a trip to serve the Jewish community in Cuba, I could not have begun studying this discipline at a more opportune moment. Through Translation Studies, I could make sense of the unfathomable intercultural crossovers I had just witnessed: Hebrew prayers sung in Cuban synagogues, bagel and lox dishes served on a summit in the Argentine Andes, and American folk jam sessions in a medieval Spanish city. Conversely, I could come to terms with the communication hiccups I experienced in what I always considered a single Spanish language among different areas of the Spanish-speaking world. It is precisely this phenomenon that drew me to Carlos Gámez Pérez’s story. In “Abductions in What Is Not and Never Was Your City,” the narrator experiences linguistic clashes between his Peninsular Spanish and the Spanish of Miami—including a hybridization of Latin American Spanish, Spanglish, and English—until a gradual assimilation of his lexicon leads him to believe he has been abducted by extraterrestrials. This work spoke directly to my experiences of arriving in Spain with a stretched out Argentine accent full of Lunfardo slang and then later visiting Cuba equipped with a peninsular dialect. Through the translation of this unique work, I hope to shed light on translation theory for multidialectal and multilingual works, which have received little attention in Translation Studies. Above all, my principal motivation for taking on this project is rooted in what first drew me to translation: its capacity for social healing. I firmly believe that making this story available to the English-speaking world now is imperative given the current political situation and the work’s unique view on immigration, assimilation, and cultural identity. Because the multiple Spanish dialects present in this short story have no true equivalents in the English language, this translation has been an arduous task, as has pursuing translation. However, the community of scholarship, curiosity, and interdisciplinary at the Bill and Carol Fox Center for Humanistic Inquiry has been the perfect environment for working on my honors thesis and pursuing translation. Our weekly Wednesday lunches activate and strengthen the critical and creative pathways necessary for a demanding project. Whether a debate centered on the academic’s role in the current political climate or a fellow’s research presentation on the socio-political implications of medieval literature, the Center has been a space to engage in interdisciplinary. Interdisciplinary at the Fox Center is what truly makes these two houses on North Decatur Road feel like a single home. Fox fellows who are specialists in their fields are always actively concerned and curious about one another’s research progression and generously offer valuable feedback originating from a perspective shaped by another discipline. Above all, my time at the Fox Center has helped me shed what renowned Translation Studies scholar Lawrence Venuti calls the translator’s invisibility. The inquiry and curiosity Fox Fellows have expressed towards translation through conversations have given me the encouragement to continue pursuing translation in a world where book cover reviews of translations fail to recognize translators and many consider translation a straightforward task a computerized algorithm can perform. 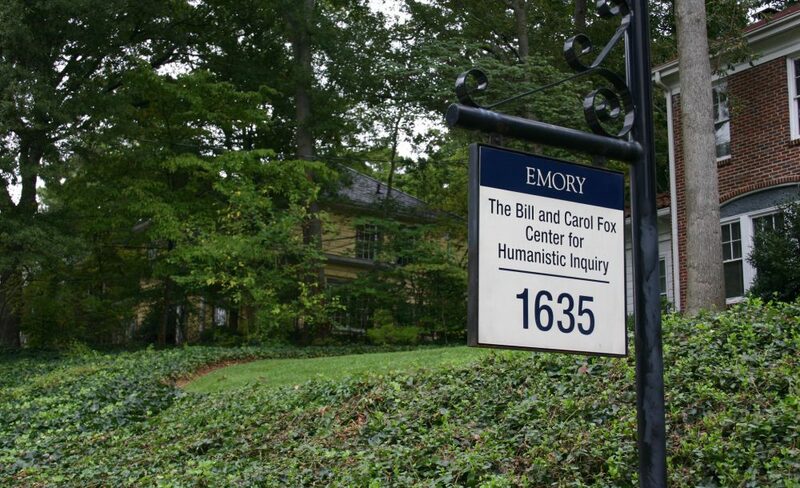 The academic friendships I have forged while at the Bill and Carol Fox Center for Humanistic Inquiry have served as a true confirmation that I wish to pursue a career in academics where I hope to one day find a scholarly community that comes close to this one that graces Emory University. Gámez Pérez, Carlos. Personal Interview. December 2, 2016. Venuti, Lawrence. The Translator’s Invisibility: A History of Translation. Routledge, 2008.